Background of the first talk: This talk was given by His Holiness the Dalai Lama concerning Shugden Practice on 13th July 1978 (at his residence ) to a group of people comprising the Ven. Lobsang Nyima, the Abbot of Namgyal Monastery, Geshe Loten, monk officials and twenty two senior monks of Namgyal Monastery, five senior monks of Nechung Monastery, two teachers of the Dialectic School, two monk-representatives, each from the branches of the Upper and Lower Tantric Colleges at Dharamsala, and Rato Kyongla Tulku and Nyagre Kelsang Yeshi, both resident in America, who were admitted by special permission. This is a transcribed and edited version of the talks, which was approved by His Holiness after he had made a number of modifications and additions. Today, I want to tell you a story, because lately, there has been some discussion about Gyalchen Shugden, and I thought I should make some comments about it to you Namgyal and Nechung monks. As you know, there have recently been some changes concerning Gyalchen Shugden and I thought I should explain the actual and the real situation concerning these changes in the beginning, middle and end. I discussed it with Kushab Khenpo (Ven. Lobsang Dhondup 1911- 1977), but no one except him had any knowledge of this until today. The origin of Gyalchen: As related in the Praise of Dependent Arising (bstod-‘brel) of His Holiness Kyabje Trijang Rinpoche (1901-1981), Tulku Dragpa Gyaltsen (1619-1656) was the origin. It is my view that Tulku Dragpa Gyaltsen’s instinctive behavior and ways of thinking were good. I have looked at his Collected Works which also contain his secret biography. He seems to have been good in his studies and to have had a gentle subdued mind. In his biography there are a few Guru Yoga texts, one of which has Buddha Shakyamuni in the centre and around him: Guru Rinpoche (9th century) surrounded by the Guru lineage of the Nyingma Order; Sachen Kunga Nyingpo (1092-1158) surrounded by the Guru lineage of the Sakya Order; Marpa (1012-1097), Mila (1052-1Í35) and Dagpo (1079-1161) – surrounded by the Guru lineage of Kagyud Order; Je Rinpoche (1357-1419) and his two spiritual sons surrounded by the Gurus of Gelug Order; in the front, are his root gurus Panchen Lobsang Chogyan (1668-1737) and the Fifth Dalai Lama (1617-1682), from whom he had received teachings directly; such was the arrangement of the merit-field. During the actual seven-limped rite of making prostration, rejoicing and so forth in relation to this, teachings of past Sakya, Gelug, Kagyud and Nyingma masters are summarized and it is explained that one should pay homage and recite eulogies through recollecting their qualities. At the conclusion, he explains that a boundless crime based on contemporary sectarianism produces causes to be thrown into bad realms and that he had written this Guru Yoga deliberately to avoid such negative results. Having seen that, I thought it was good. Usually, Gyalchen is considered a biased deity, however, since there was this account in the Collected Works of Dragpa Gyaltsen, I thought it was good. In the Collected Works of His Holiness Sonam Gyatso (the Third Dalai Lama 1543-1588), it is related that, at one time, when the young Rinpoche was playing with water in his private apartment Drung Sung Rabpa, an attendant, disapproved and rebuked the young Rinpoche. When the young Rinpoche paid no heed, the attendant said, “Panchen Sonam Dragpa (1273-1345) will take care of me, I shall go to the upper residence”. This statement is actually quoted. In view of this, it seems that there were two residences, (bla-brang), the so called lower residence of the Dalai Lama and the upper residence of those of the lineage of Tulku Dragpa Gyaltsen, both of whom seem to have been quite famous. As a result of this it seems certain there were petty conflicts between the staff of the two residences. In one section of the biography of the Fifth Dalai Lama (1617-1682), there is an account of his once spending a week in retreat and preparing to perform the Mashi ritual on the day of an eclipse. That morning he felt very sluggish and his meditation session remained unpleasant. On the same day a message was received unexpectedly that the Tulku of the upper residence was sick. When His Holiness the Fifth Dalai Lama visited him, he saw that Tulku Dragpa Gyaltsen had been seized by an evil spirit and had lost consciousness. His Holiness also stated clearly that the sluggishness in his own body have been the result of a similar attack (gdon-grib). If you go through the biography of His Holiness the Second Dalai Lama, Gedun Gyatso (1475-1542), it seems that Nas Nying Gyalpo (a local deity from Nas Nying, Tsang) had some influence on the lineage of Dalai Lamas. Moreover, although it is not stated in the biography of the Fifth Dalai Lama, according to common tradition, it is believed that Dragpa Gyaltsen was killed by stuffing his mouth with scarves. There is also an account that in, one of the previous incarnations of the lineage of Dragpa Gyaltsen, Nechung caused this to happen. Since these appear in the common texts, I need not explain them in detail. Anyway, according to common knowledge, it is said that a relationship developed between the Fifth, Dalai Lama and Tulku Dragpa Gyaltsen and that Tulku Dragpa Gyaltsen arose in a wrathful aspect; such is the common belief. It is further said in the general Collected Works of Fifth Dalai Lama that Dol Gyalchen displayed a strong miraculous power. There is an account that in order to repress this the Fifth Dalai Lama himself performed wrathful rituals. Similarly, it seems that in the same connection that Rigzin Terdag Lingpa of Mindol Ling monastery and Rigzin Pema Trinley of Dorje Drag performed two Fire-rituals simultaneously, one at E-WAM and the other at Potala. It is mentioned, in the Collected Works of Rigzin Pema Trinley, that during this wrathful rite which was deliberately aimed to annihilate Dol Gyalchen people actually smelt the odor of raw meat burning. From then on (Dol Gyalchen) was captured for ever. This is one story. Another account has it that Se-trab (bse-khrab) rescued Gyalchen and therefore he could not be burnt. Again, another common story tells that after Tulku Dragpa Gyaltsen arose in a wrathful aspect, he went to Tashi Lhunpo because he was a disciple of Panchen Lobsang Chogyan. However, he was unable to get into Tashi Lhunpo, which was guarded strictly by the Namse Ta Dag Gyad (rnam-sras rta bdag brgyad) protectors. This is a point which warrants consideration. At that time, Panchen Lobsang Chogyan, who was the head of the Gelug Order, was residing at Tashi Lhunpo monastery and if his disciple Tulku Dragpa Gyaltsen had arisen in his wrathful aspect, then Namtho-Se (rnam-thos-sras), one of the guardians of the three types of disciples should have escorted and welcomed him as commanded by Je-Rinpoche. Anyway for whatever reason, when he went to meet his Lama he was unable to do so and met with difficulties. At that time it seems that a hierarch of the Sakya Order seeing some purpose in doing so, took care of Gyalchen and so Gyalchen came to form a relationship with the Sakya Order. This is one version of events. Now, Tsang Yang Gyatso, the Sixth Dalai Lama (1683-1706) was a strong Nyingma practitioner, and during his reign the tradition of the Fifth Dalai Lama remained healthy. Subsequently, the Seventh Dalai Lama followed purely the Gelug Order, in which case he ought to have had a connection with Gyalchen, yet there is no mention of such a relationship in his Collected Works. Since then there had been no Dalai Lama until my predecessor who seems to have had any connection with Gyalchen. There is another story that when either Tsultrim Gyatso, the Eighth Dalai Lama (1758-1804) or Lungtog Gyatso, the Ninth Dalai Lama (1805-1815), was traveling through Kham, Gyalchen came through his medium and sought an audience with him. This a story from the very place. Beyond this, Gyalchen has had no particular connection with the lineage of Dalai Lamas. It seems that during the time of Panchen Lobsang Yeshi (1668-1737) there wasn’t any connection and consequently, even during the time of Panchen Palden Yeshi (1738-1780) there probably was not any connection. I don’t know how the situation stood during the life of Panchen Tenpai Nyima (1782- 1853), but there is an account that during the life of Panchen Tenpai Wangchuk (1855-1882) there was some rivalry between him and Gyalchen. I do not know how this happened, but it may be that either he first propitiated Gyalchen and then late they became rivals or that their rivalry occurred without their having any connection to begin with. 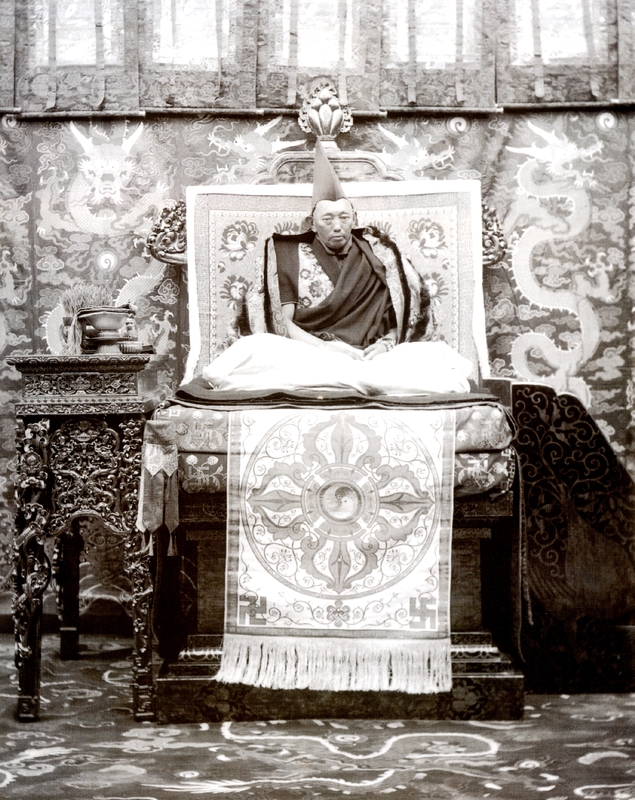 The 13th Dalai Lama, Thubten Gyatso (1876–1933). During the reign of my predecessor, the Thirteenth Dalai Lama (1876-1933), the performance of many deity-mediums were banned and in particular the Gyalchen medium was banned quite strongly. However, he did not ban Gyalchen’s performance from Lhasa Trode Khangsar, although it seems, he issued a legal warning to the public. In those days, the ban was strictly enforced even in Drepung and thus, the only image of Gyalchen in the Drepung Tantric College had to be removed. It was traditional for the monks of Drepung Tantric College to blow conches and trumpets while summoning Gyalchen and this was also banned. Similarly, in Ganden too those who propitiated Gyalchen were rigorously warned against doing do. Just after the Thirteenth Dalai Lama banned this practice, the Ganden Throne-holder, who was either Minyag Ami or Yeshi Wangden relentlessly applied the law and so it occurred that even in Ganden propitiation of Gyalchen had to be carried out very secretly. This is what happened during the reign of my predecessor, the previous Dalai Lama. Then, I make a mistake. If you ask what that mistake was? It was that I was unable to follow the exclusive tradition of the previous Dalai Lamas. Moreover, when I went to Dromo, I had to stay at Dromo Dunkar monastery, where there was a tradition of summoning the wrathful and peaceful aspects of Gyalchen through the medium of a monk. The medium himself wasn’t a particularly good scholar, but when the deity was summoned he seems to have given clear prophesies, which was much appreciated. It had so happened that I had left Lhasa for Dromo rather hurriedly and the mediums of Nechung and Gadong were not among the entourage. In those days, I did not have a close connection with either Nechung or Gadong, such that I would summon them in my private apartment, except that they were invoked during the summer, winter and annual ceremonies. In any case, until then had been a growing child and it goes without saying that I could not think independently about deity devotion; in fact I could not even think about things in general that much. However, it was on that occasion that neither Nechung nor Gadong were with me, although it was a crucial juncture in negotiations between Tibet and China. Amongst the officials there were those who wanted me to return to Lhasa and those who wanted me to go to India and so it became very difficult for me to decide. At this crucial point there was, for one thing, a good monk medium nearby and, for another, my strong faith in Je-Phabong Kha, because of which I felt a close bond with him. Also, Kyabje Trijang Rinpoche had a strong affection for me and this was a further cause. Anyway, with the coincidence of many causes I finally had to summon Gyalchen in my apartment at Dromo. While summoning him, the monks chanted the Hundred Deities of the Joyous Land (dga’a-ldan lha-grgya-ma) to the tune of Sangphu monastery. In the course of the actual performance the medium wore yellow robes, chogo and namjar, and a pandit’s hat in which he looked quite eminent. Facing towards me, he prostrated like a felled tree. When asked for predictions and advice, he answered fairly clearly. Once he said, “I have just come from Tushita after enquiring of Je-Rinpoche”. Everything seemed to be fairly well resolved. Then, while returning from Dromo to Lhasa my intention to propitiate Gyalchen increased and consequently I summoned the wrathful Shugden in the main hall of Dunkar monastery and I offered him a new costume. This is how my relationship with Gyalchen developed at the beginning. This was the first time that the Fourteenth Dalai Lama made a mistake, not being able to stand on my own two feet I didn’t follow the path shown by the previous Dalai Lamas. During the regency of Kyabje Tagdrag Rinpoche (1874-1951), Geshe Tsewang Samdrub let monks perform the wrathful ceremony of Bhairava at Chagpori and Chensel Lingkha, and when I had already left for Dromo, Geshe Samdrub performed the ceremonies of increase and power and he deliberately sent their mystic wheels (‘phrul-‘khor) to me at Dromo. In this way I developed some connection with Geshe Samdrub. Later I returned to Lhasa. Jampa Choesang, the chief attendant, was a very close friend of Geshe Tsewang Samdrub, who lived at Chagsam. Choekhor Yangtse’s Gyalchen Choje, presently at Mundgod, and Geshe Tsewang Samdrub also seemed to be very close friends. Because of these relationships, I once received a prediction from Choekhor Yangtse’s Gyalchen via Geshe Tsewang Samdrub and my chief attendant, Jampa Choesang. Subsequently, I used to send my servants back and forth to Geshe Tsewang Samdrub through my chief attendant Jampa Choesang with enquiries for prediction. In this way I requested predictions from Choekhor Yangtse Gyaltsen quite often through Geshe Tsewang Samdrub. At that time, in accordance with the counsel of Choekhor Yangtse Gyalchen, the Bhairava, Rigjema and Kalacakra statues at Lhasa Shol were erected. In the same period during one of the monk medium’s trances, he said, “Next year on the third day of the Tibetan New Year you must offer a grand invocation ceremony to me, and if you do so there will definitely be an omen to examine”. Thus, on the third day of the first month of the Tibetan New Year, after performing the Tsetor ritual and making dough-ball offerings to Lhamo in the morning, an extensive invocation prayer to Gyalchen was chanted. As there was then neither a thanka nor a statue of Gyalchen in my apartment, I borrowed a thanka of Gyalchen from Kyabje Trijang Rinpoche and hung it up. That night I had a dream in which I saw a few yaks and Serchen flowers under an overcast sky on the lawn behind the Mahakala chapel at Norbu Linkha. I saw the Esteemed Abbot (Ven. Lobsang Dhondup) holding a golden scoop filled with melted butter. This was a good sign, but the yaks I had seen raised some doubts. When I reflected on this now, the yaks probably represented evil portents (dam-sri). This was my dream. From then onwards until the year before last (1975) an extensive invocation ceremony was offered to Gyalchen annually, on the third day of the first Tibetan month. Subsequently, a new thanka of Gyalchen was painted, a copy of the one owned by Kyabje Trijang Rinpoche. This is also mentioned in the biography of Kyabje Trijang Rinpoche. Then, one day, in order to examine the Choekhor Yangtse Gyalchen, I sent a letter in accordance with the usual custom for consulting him, in which I did not write the meaning explicitly but wrote it secretly in cypher. The reply returned also written in cypher which was not very clear, but it appeared that the meaning could be inferred if one wished to do so, which indicated his dissatisfaction. From then onwards I had no further connection with that medium nor did I summon Choekhor Yangtse’s Gyalchen. I may have requested an invocation rite once or twice, through Trijang Rinpoche but otherwise there has been no special connection. I offered a grand invocation ceremony to Gyalchen on the third of the first Tibetan month and usually as a part of my daily recitation, I recite the invocation prayers of Gonpo, Cheokyong, Lhamo, Namse, Zhal, Chamsing and Gyalpo Kun-nga concluded by the words: “Rang Nyid Yi-dam…..” and so forth from the invocation of Gyalchen. So this has been about my connection with Gyalchen at the beginning and in the middle. Sometime back, during the life of the previous Dalai Lama (13th), in one of his declarations Nechung said, “You have neglected the indispensable black stupa, but white-washed the rock unnecessarily”. Likewise, I did not cultivate a special relationship with Gyalpo Kun-nga in general, nor specifically with Dorjee Dragden who had a long standing connection with the lineage of Dalai Lamas, which can be traced back to the Tibetan King, Choegyal Trisong Deutsen and even further to a relationship with Gyalpo Kunchog Bang. On the top of this it seemed, that I was cultivating a relationship with a new deity who had no responsibility to the Tibetan Government and no relationship with the lineage of the Dalai Lamas. However, just before I left for China I began summoning both Nechung and Gadong in my private apartment. Since then, through summoning them we have gradually become close and well acquainted with each other and their predictions have also become more precise. This is because, as the common saying goes, “the deity and the people have the same habits”, and consulting them became quite convenient. Since then, from a practical point of view, it has been unnecessary to maintain a relationship with Choekhor Yangtse‘s Gyalchen or any others. I have summoned both Nechung and Gadong whenever necessary and for those matters which neither could resolve I have applied the method of throwing dough-balls. There have been many instances when even this latter method has been valuable, but as they have not been related before, there is no need to disclose them now. In 1956, the Chinese raised objections concerning my proposed visits to India, and as the situation became more difficult Nechung predicted, “There will be no problems at all and your wishes will be fulfilled” and eventually everything went well. Later, we were faced with a further quandary over whether I should return to Lhasa or not and consequently both Nechung and Gadong were summoned. Nechung was particularly determined and declared that it would be better to return to Tibet since there was no advantage in staying in India. In 1959, during the period of revolt against the Chinese rule, Nechung was summoned on a number of occasions and it was Nechung who decided the day, exact timing and even the route to be followed for my escape from Norbu Linkha. In any case it proved absolutely successful and free of difficulties. Both Nechung and Gadong are quite resolute on important issues, but Nechung in particular is infallibly resolute. After arriving in India, I stayed first at Mussoorie and then moved to Dharamsala. Soon after my arrival in Dharamsala, I wanted to receive “Life Entrustment” (srog-gtad) of Gyalchen from Kyabje Trijang Rinpoche and therefore I mentioned it to him. At that time, someone, whom Kyabje Rinpoche did not remembered clearly, had offered him a copy of the ‘Great Lam-rim’ in a fine old edition from Ganden. Trijang Rinpoche set it aside saying, “I shall give it to you, because we need to have a ‘Lam-rim’ text during the Gyalchen “Life Entrustment” ceremony”. Sometime later when I have moved my residence from Swarg Ashram, to Theckchen Choeling, I summoned Nechung and Gadong and Nechung declared, “Propitiating A-say Khenpo was a mistake”. I thought that during the life of the previous Dalai Lama (13th), there was a saying that A-say Khenpo meant Gyalchen Shugden, but doubting that it was the same, I asked Nechung what he meant and he confirmed that his statement was about Gyalchen. Then I said to Nechung, “At present there are many people who propitiate Gyalchen and if Nechung were to make such a statement publicly it would ruin the spiritual bond in the hearts of many people. Therefore,” I said to Nechung, “it will be better if you keep silent”. Nechung just said, “Yes”, and since then until the release of the yellow book known as the Oral Transmission of the Intelligent Father (pha-rgod bla-ma’i zhal-lung), that is for nearly seven or eight years Nechung has spoken not one word about the matter. When Nechung spoke like this, I asked him to keep quiet out of an unflinchingly pure concern for the mental turmoil and disunity this could cause amongst my people and since then Nechung has said nothing about it. However, I learned a lesson myself, for I realized it was not proper to offer “Life Entrustment” to Gyalchen. In those days I liked Gyalchen and I had an inclination towards him, because of the spiritual lineage of Kyabje Phabongkha, felt close to Gyalchen, nevertheless there is a conflict between Gyalchen and Nechung. If you ask who is the person most closely acquainted with Nechung beneath this sky? Excepting those with clairvoyance and speaking generally, amongst human beings I am the person most closely acquainted with Nechung, and similarly, Nechung is probably the deity who knows most about me. It is a commonly held notion that Gyalchen was coerced by Nechung, therefore, even Trijang Rinpoche remarked in his Praise of Dependent Arising that it is impossible for there to be any conflict between Nechung and Gyalchen. But this is only a common notion, for no matter what the man in the street may say, it is a fact that there is a conflict between Nechung and Gyalchen. Personally, I don’t see Nechung as “that old deity” and Gyalchen as “this new deity” and if I had to choose one between them, I would definitely choose Nechung and not Gyalchen. So, because of this, I thought that I should not offer “Life Entrustment” to Gyalchen and I did not do it. However, since it is not easy to make such a decision hastily, both Serkong Rinpoche (1914-1983) and I discussed it and I disclosed all the recent occurrences to him. This was when I was receiving A Lamp on the Path to Enlightenment (lam-sgron) teachings from Serkong Rinpoche, we were talking over tea during a break when there was a loud resounding ‘bang’ of a stone hitting the roof. After this I brought the matter to the notice of Yongzin Rinpoche (Ling Rinpoche 1903-1983) telling him what had happened and asking what it would be best to do now. Yongzin Rinpoche told me that the matter was very important and that it would be better not to offer the “Life Entrustment” ceremony. Since I had already requested Trijang Rinpoche to offer the “Life Entrustment” ceremony, I informed him of all the circumstances clearly, told him that wouldn’t now offer the “Life Entrustment” ceremony, and gave up my plans. At that time, except for deliberating over whether I should offer “Life Entrustment” or not, I made no change in my regular personal practices of both reciting the annual invocation prayers and the daily offering of invocation. H.H. 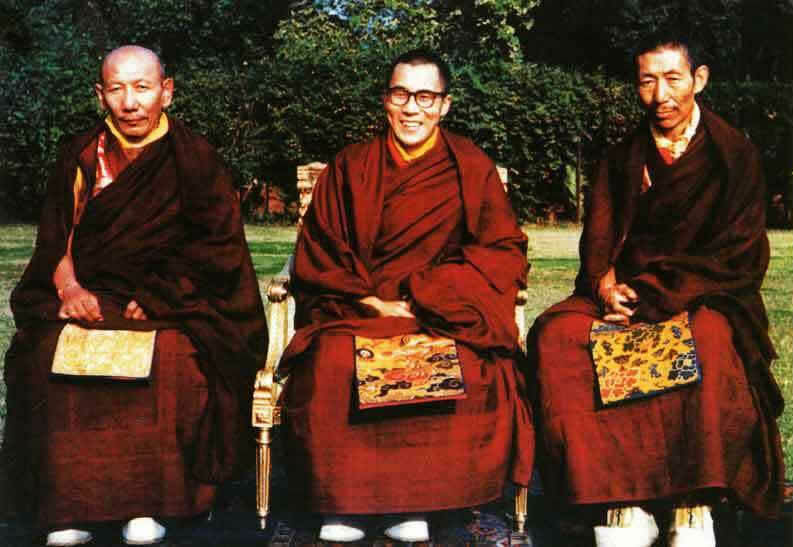 the Dalai Lama (middle) and his two main tutors. On the right side of H.H. the Dalai Lama sits Kyabje Ling Rinpoche, his senior tutor and on the left side sits Kyabje Trijang Rinpoche, his junior tutor. Sometime after that, in one of his declarations Nechung said, “A Hundred Thousand Tsoq must be offered to Guru Rinpoche at the Tsuglag Khang (main temple) and if this is done an omen for the general cause of Tibet will appear”. The first time we offered a hundred thousand tsog to Guru Rinpoche we didn’t have anyone well-versed in Nyingma rituals and I had yet to come across a text of Extensive Secrets (gsang-ba rgya-can). Finally, I found the Secret Sadhana of Hayagriva (rta-mgrin gsang-sgrub) in the Tamdring Section of the Collected Works of Thu’u Kan (Chokyi Nyima 1737-1802) in which there were beautiful descriptions of how to offer Tsechu,Tsog and the reasons for offering Tsog to Padma Sambhava. Although it was compiled by him, it is basically a collection of the teachings of Gyalwa Gedun Gyatso (Second Dalai Lama 1475-1542) and Panchen Lobsang Choegyan; I based the text that we have been reciting at Tsuglag Khang on this. Then, a few years later during the offering of one hundred thousand tsog in the tenth month of the Wood Rabbit Year (1975) some Gelug monks and nuns hesitated to join the gathering. It is generally believed that all Tibetans wish for the independence of Tibet; erecting a statue of Padma Sambhava and offering a hundred thousand tsog in the Tsuglag Khang is not a duty incumbent on me, Tenzin Gyatso. Guru Rinpoche is the Guru of all Tibetans, his compassion and oath have a special power especially during this dark period of degeneration when both the human and non-human beings of the black side have the upper hand. From their own side Tibetans have a special karmic and virtuous connections with Guru Rinpoche. It is for this end and these reasons that we maintain a connection with Guru Rinpoche, therefore, it is important that we (Tibetans) should pray to him. I felt quite uneasy when people behaved like this over such an important, common issue. During this period of my life when I have a real responsibility to work for the cause of Tibet as best I can, it is possible that a dissatisfied person or one who is ignorant of the actual situation may create a cause for disunity, this is natural and I should certainly excuse them. However, Kushog Zemey is neither and is fully aware of my past and present views on sectarianism. The Teachers Training College which was first started in Dharamsala, later had to be moved to Kangra because of some problems with the then house of the Tibetan Cultural Printing Press and one day I purposely visited them in Kangra. In the main hall, I sat in the middle while Kundeling and Zemey sat on either side of me. There I gave a long talk to the teachers training group, in which I said that those who recognize Gelugpa practitioners and philo­sophy as perfect and others as imperfect must also agree that in Tibet before the time of Je-Rinpoche, there had been many practitioners in Tibet who attained the state of unity. I pointed out that these practitioners must have advanced through discerning the correct view, for if, within themselves, they lacked unmistaken view, meditation and conduct, it would be impossible for them to have gained realization beyond the great or middle path of preparation. For these reasons, since Kagyu, Nyingma, Sakya and Gelug traditions are all equally profound dharmas, unifying sutra and tantra teachings aimed at the spontaneous achievement of Buddhahood. I stated clearly that there is no point whatever in talking about good or bad religious traditions. As Zemey Rinpoche was present there, he heard everything I had to say and it is impossible that he didn’t understand. What’s more under the aegis of Kyabje Trijang Rinpoche I took him to China, in 1956, on the 2500th anniversary of Buddha Jayanti, I took him to India. Then, after my arrival in India following the revolt of 1959, selecting him from among equals, I appointed him as the Principal of the Teachers Training College. So he is one who knows quite well what is going on and who has continually received good treatment; then he behaves like this. I give thought to the issues concerning Tibet and maintain a policy, yet it may be that someone is unable to make a beneficial contribution to it in the way that rain aids a river, nonetheless it can never be fitting for him to do something harmful. Even if such conduct was not knowingly, or intentionally an act of spite, it is a hundred percent certain that it was an invidious act of carelessness which is clear even to a blind man. To be frank, I felt extremely sad about it. How would the situation seem to others, when a person whom the Dalai Lama had singled-out from among equals and to whom he had given responsibility, writes such a book. He is a direct disciple of Kyabje Trijang Rinpoche and Trijang Rinpoche is my Guru, therefore, a thinking person might say: “Ah they belong to the same faction, but they vary only in their degree of frankness. The Dalai Lama’s Guru speaks like this and a man to whom the Dalai Lama has given special attention speaks in the same way. It doesn’t matter if the Dalai Lama says that there is no discrimination in his policy towards the cause of Tibet, when, in fact, this is the actual policy or thought at the core of his heart.” Kyabje Trijang Rinpoche as well as Zemey Rinpoche should have given thought to this, but unfortunately they didn’t. In the first place there is a crucial doubt about whether the contents of the text should be accepted literally, but ultimately I think one can only say, “I think it means this… … or may be it means that”. If we accept that it is true, then it is difficult to categorize it as something worthy either of praise or blame. Think in particular, how far it serves the purpose if we seemingly view the pre-eminence of the Gelug tradition as restricted to the issue of a controversial Dharma Protector. Even if we say it was a praiseworthy work, since the need to stop it is greater then the purpose it serves, is it not rather something that should have been kept quiet, for, at present what good purpose does it serve when told? To be specific, if this theme, “the root of corruption” refers to the unbiased practice of Sakya, Gelug, Kagyu and Nyingma teachings by one individual, then the previous Dalai Lamas, the 2nd 3rd and especially the 5th Dalai Lama were extremely corrupt in their practices, weren’t they? Then the 5th Dalai Lama’s words: “May the teachings of the Second Buddha, Lobsang, flourish for ever without corruption” is a great falsehood. He was a scholarly monk, how could he tell a lie contradicting the facts? When the omniscient Khaedrup in his Commentary on the View – A Lamp Dispelling Darkness (Ita-khrid mun-sel sgron-me) supplements the Sakyapa’s Cause and Continuity of Mind-Basis of All (kun-gzhi rgy-rgyud), a means of meditation on the view of inseparability of cyclic existence and nirvana, he never intermingles their terminology with that of Je-Tsong Khapa’s [small text passage missing?] that it is inappropriate to mix up the terminology exclusive to each tradition by imposing one’s own interpretation. He advises: “Do not mix the meaning and terminology of others in this context. Here I shall not mix them either, for to do otherwise becomes a cause for the loss of all the individual traditions of instructions.” If it is thus inappropriate for Gelugpas to practice Nyingma teachings and for Nyingmapa’s and others to practice Gelug teachings, then from Gyaltsab and Khaedrup down, many other Gelug Geshes have corrupted the doctrine. At present there are some Gelugpa’s who view it as inappropriate should a Gelugpa practise Nyingma teachings, but take pleasure when a Nyingmapa listens to Lam-rim teachings. This contradicts the thought of Khaedrup-Je concerning the corruption of Gelug teachings through their being intermingled with Nyingma teachings. In short, it seems as if each sect has to turn its back to the other, as if a Buddhist were meeting a non-Buddhist. Therefore, the meaning of corruption should be understood not as the unbiased, eclectic practice of one individual, but as the mixing and inter-appropriation of transmissions exclusive to each tradition. Consequently, there is no borrowing of terms exclusive to Sakya and Nyingma teachings in the Fifth Dalai Lama’s commentary to the Gelug Lam-rim – the Transmission of Manjushri (‘jam-dpal zhal-lung), nor any appropriation of terms exclusive to Sakya and Gelug teachings in his Commentary on Dzoqchen Doctrine (rdzogs-chen lta-khrid rig-‘dzin zhal-lung). Therefore, I think that the actual view of the omniscient Khaedrup is to maintain purely the terminology exclusive to each tradition. As is said in the Ornament for Clear Realization (mngon-rtogs-rgyan): “Those benefiting migrators will accomplish the deeds of worldly beings only through knowledge of the paths”. When a person with a Mahayana disposition needs to be trained through listening to, thinking about and meditating on the teachings of the greater and lesser vehicles, how can it be a fault, rather, isn ‘t it praiseworthy when someone practices all the Sakya, Gelug, Kagyu and Nyingma teachings through listening, thinking and meditation according to his own level of realization? Recently, as a result of the circulation of Zemey’s book, Dongthog Rinpoche wrote a rejoinder. I was told that having heard of this a few Gelugpas at Varanasi became impatient and were preparing to write a rejoinder to Dongthog’s text. It appears there was a rumour among them that Dongthog had not written his text himself, but that it was composed by Dudjom Rinpoche and credited to Dongthog. Now, how does this look? It wouldn’t matter if both Zemey and Dongthog met and debated face to face, yet when it has been clearly stated that Zemey’s text was taught by a principal Lama of the Gelug, Trijang Rinpoche and it is rumored that Dongthog’s text was written by Dudjom Rinpoche, then ultimately both Trijang Rinpoche and Dudjom Rinpoche become responsible. Since this was becoming a source for an increase in sectarianism between our religious traditions, I was compelled to ask the Council of Religious Affairs to issue a notice stating that the root from which the poison spread was Zemey’s book and that at this crucial time everyone should think seriously of working together to benefit the teaching of Buddha in general, for creating causes of disunity can never be justified. Following this notice no rejoinder was written from the Gelugpa side, and while no doubt some Nyingmapas considered writing their own rejoinder they restrained themselves, so there was no response from the Nyingma side either. Dongthog wrote his rejoinder being personally a Sakya, but also an admirer of all the religious traditions and their philosophies. The situation was such that there was a grave risk of conflicts arising. I thought to myself that until now I had stopped Nechung from making any statement, but to do so further wouldn’t be fair on my part. So one day, when I had summoned Nechung in my private apartment; I asked him clearly about the matter. Eight or nine years ago when Nechung told me it was not appropriate to rely on A-say Khenpo, I told him straightforwardly that it would be better for him to keep quiet about it and the Dharma Protector has maintained silence till now, for which I am grateful. However, it would be unjust of me to continue to restrict Nechung’s statements on the one side, when the other side are able to say what they like. According to legal procedures too, it is not justified to let one side say whatever they wish and to restrict the other side from saying anything. So I told Nechung he could say whatever he had to say and that I would support him by upholding the truth of his statements. The Dharma Protector took time to relate a number of past and recent historical events concerning Gyalchen Shugden. The gist was that more harm than good comes from relying on Gyalchen Shugden. To be more precise, the kinds of calamity and misfortune that occur and the catastrophes that eventually arise are apparent among the people who are at present relying on Gyalchen Shugden. Also, except for a yogi who has really reached a high level of spiritual insight and relies on Gyalchen in a most secret way, it is more dangerous and more disadvantageous than beneficial if the current practice is continued. Moreover, it is said that relying on Gyalchen Shugden displeases Palden Lhamo. This is what I have understood about Gyalchen. There has been some debate over whether Nechung and Gyalchen are in harmony or not, but this discord between Lhamo and Gyalchen is a new thing. If there is discord with Lhamo it is of primary concern and extremely important, therefore, I thought it would be good to take every precaution on my part. Until then, it was either the 6th or the 7th month of the Rabbit year, I had recited the invocation prayer as usual, but later, towards the end of winter as the New Year of the Dragon was approaching; it occurred to me to thoroughly examine whether propitiation rituals should be performed this time or not for usually an elaborate propitiation had been conducted at the beginning of every year. I was doing a retreat at the time reciting the six-syllable mantra and the personal mantras of Chenrezig Gyalwa Gyatso, as I had recently received that initiation from Trijang Rinpoche. The Abbot of the Namgyal Monastery was not here at the time as he had gone to Varanasi for dental treatment. On his return, I decided to prepare for a grand invocation offering to Palden Lhamo prior to performing a dough-ball divination and then implement whatever the result indicated. I put my confidence in this dough-ball divination. It was either on the 15th or the 16th of the last month of the Rabbit year when the Esteemed Abbot returned. On the 18th or 19th, the Esteemed Abbot and I, with 15 monks of Namgyal Monastery, assembled and chanted the invocation prayers of Palden Lhamo. On that day, the weather was stormy and there was thunder and so forth. Before preparing dough-balls for the divination we had recited the ‘Crowning Ceremony Prayers’ (mnga‘a-gsol). As we chanted the line, rnal-‘byor-srung-ma’i-gtzo-bor-mnga’a-gsol-gyi — “I enthrone you as principal protector of yogis” the light went off. The electricity in Dharamsala is unreliable, so I thought I should not jump to any conclusions about it. However, I thought that if it were an omen then of course it would be true. The reason being that Palden Lhamo has been a definitive all-encompassing Dharma Protector from the time of Gyalchog Gendun Drub. Knowing this, I still continued to rely on Gyalchen, so reciting the line, “I enthrone you as the principal protector of yogis” had become somewhat meaningless. It could have been a true omen, because the real situation was different from what that line says. Three things were written on pieces of paper during the actual preparation of the dough-balls for the divination. On the first piece of paper was written, “It is good to rely continually on Gyalchen”. It had been decided that if this were the outcome there would be no change in the annual and everyday invocation rituals. On the second piece of paper was written, “It is good to rely on Gyalchen in a very secret way”. It this were the outcome, I thought of doing propitiation rituals in private but without involving the assembly of the Namgyal Monastery. I thought of chanting invocation prayers as I do daily. On the third piece of paper was written, “It is good to stop relying on Gyalchen”. I had decided it would not be necessary to chant invocation or propitiation prayers if this were the outcome. Each of us recited “Jo Dunma” (bhyo-bdun-ma) a thousand times and then chanted the ‘Crowning Ceremony Prayers’. Mindful of the great importance of the matter we rolled up the three pieces of paper while making profound prayers. “Stop relying on Gyalchen” was the final outcome. On the same day, I performed another divination with dough-balls containing the names of a few candidates to be appointed as abbot of Namgyal Monastery and final outcome favored the Esteemed Abbot. After the dough-ball divination I felt comfortable at heart, for I had arrived at final decision as to what I should and should not do. Likewise, I felt much more confident, if a little surprised, because I could see that things had turned out as Nechung had told me they would. That night, I found it quite hard to stop doing the invocation prayers so I said them before going to bed. Next morning at dawn I had a dream that Trijang Rinpoche was sitting on a pair of soft cushions near the windows of a room where I used to receive Dharma teachings from my two Tutors, Serkong Rinpoche and so on. Trijang Rinpoche was sitting dejectedly on the last cushion near the door, resting his head on the floor-carpet. When I arrived I asked Trijang Rinpoche not to sit like that, saying that if he would like to sleep he could lie down properly on both the cushions with his head away from the door. Trijang Rinpoche replied, “No, I am going now”. “May I offer you a cup of tea?” I asked. “No”, he said, “I am going”. Then I asked, “Oh, may I offer you a cup of hot water ?” and to this he agreed. I took a glass and flask in my hands and poured him some hot water. He drank it and took two light blue tablets of western medicine and then told me he was going, so I came out with him to see him off. Then he left by the back door of my former residence, passed by the stairs and went along by the kitchen and left in that direction. When Trijang Rinpoche had gone, I found men who looked like Khampas, their upper torsos bare, on either side of the office. I thought they had come to see me out of faith. Then I went back to my house. Such was my dream. When I awoke, I had a thought that Trijang Rinpoche and Gyalchen were extraordinary. It was extremely clear that Gyalchen had caused my dream and that it was a sign from him. Both Nechung’s declaration and Palden Lhamo’s dough-ball divination had indicated that Gyalwa Rinpoche should cease to rely on Gyalchen, although it seemed this had somehow saddened Trijang Rinpoche. However, there was no mistake from my side, Trijang Rinpoche had told me he would be going so I went see him off and in parting we smiled at each other. Only then did things become clear and this was the meaning I found. Moreover, as I had been caught between two parties, Gyalchen – a wrathful deity and my Guru Trijang Rinpoche on the one hand and Nechung and Palden Lhamo on the other, I had a difficult time, not knowing what to do or how to act between them. However, with the result of the dough-ball divination and the clear absence of any sort of negative reaction from Gyalchen in the dream, I felt a sense of relief. It was like having my eyes opened with respect to my personal relationship with Gyalchen and his practice. Because I now had to make changes in the performance of the annual propitiation rituals in full view of the Namgyal monastic assembly, an explanation was imperative, but I felt rather uncomfortable about explaining it to them and I wondered what would be best to do. Although my own decision about what I should practice and avoid was clear-cut, I was unsure whether I should speak about the matter to others or not, so I threw a “Mo” (dice- divination). The questions I asked were, “Would it be good to keep the outcome of the dough-ball divination to myself without disclosing it to others ?” and “Would it be good to explain to others what I have seen?”. “It is good to tell others” was the result. So, on the same day, I called the Abbot of Namgyal Monastery to my office and asked him, “Was the dough-ball divination we did last time effective or not?” He replied: “In general, there is no question of Gyalwa Rinpoche’s dough-ball divination being effective, it is always effective and would not be anything else. On this particular occasion the dough-ball divination could not fail because “Jo Dunma” was recited a thousand times and it was accompanied by profound prayers”. Assuming it was accurate, I explained to him the complete history of past and recent events. The Esteemed Abbot and I shared the same opinion and we became “Comrades” as the Chinese say. He was a very confident, magisterial, hard-headed man devoted to the Gelug Tradition and having great faith and respect for Palchen Phurpa (dpal- chen phur-pa). In short, he was a person who followed whatever policy I decided, sincerely and without hesitation. That’s why when he died I was sorry and felt a sense of loss. When I explained to him all that had happened concerning Gyalchen up to the previous day he agreed with me unflinchingly. “Yes. Yes. That’s right”, he said, “I have no misgivings about that”. I sent word through him that it was not necessary to do the annual propitiation ceremony. Sometimes Namgyal Monastery also recited invocation prayers to Gyalchen during their daily invocation rituals and particularly, some time ago, they started saying Gyalchen invocation prayers daily at my house during their evening invocation session. We felt a little uncomfortable to make any sudden changes, big or small, until a suitable occasion arose. The Esteemed Abbot and I decided to make an announcement when such an occasion presented itself. He himself was a person who had entrusted his life to Gyalchen, but he was not restricted over that, he was able to continue to rely on Gyalchen. These recent events are both secret and inconceivable. In the past, Ra-lotsawa, Darma Do-de, Nyan-lotsawa and so on killed each other through their magical powers. Killing one another is the final result of disharmony. Yogis were killing each other, yet inasmuch as they had become adept in the higher levels of Secret Mantra it is impossible that they had not developed the mind of enlightenment in their mind-streams. A qualified tantric practitioner who possesses Bodhicitta, the altruistic mind to become fully enlightened for the sake of others, will generally not harm even the life of an insect. Accounts of yogis who killed each other in demonstration of their magical powers are controversial, yet such things are inconceivable to the minds of ordinary people like us. Such things occur for another reason and purpose. Explaining this to the Esteemed Abbot, I told him that these things are called very hidden and are thus inconceivable. It had become clear that if Gyalchen is relied on, then a conflict arises with Palden Lhamo and Gyalpo Kun-nga. But then, that is no reason to praise one and despise or disparage the other, we can be neutral. I told him, “There is nothing wrong in your continuing to rely on Gyalchen yourself”. From that night onward however I stopped saying Gyalchen’s invocation prayers and did not even let them resound in my mind. I was able to sleep soundly without the slightest sign of disturbance from Gyalchen. Sometimes I could not sleep because of a rise in blood pressure, but apart from that, there were no interferences which I suspected to be the work of gods or spirits. Once or twice afterwards I had a dream which I thought was of Gyalchen. Once I dreamed of Trijang Rinpoche sitting in a small room, which he told me had moved to. He was sitting there as a simple monk and said, “I am happy here”. There was a little monk to serve him. I offered him a flower. I thought this was something. Then, on the third day of the New Year, I told the ritual assistant that now, in keeping with the traditions we observed in Tibet, we could confine ourselves to the recitation of Palden Lhamo’s prayers only. I did not make any special mention of Gyalchen. Although at times we used to recite prayers of Gon-Chos-Begtse (mgon-chos-beg-rtze) etc. in addition to the Lhamo prayers, on that occasion, without offering many reasons, I told him that we would recite only those prayers which had been formerly recited in Tibet. At the time, you Namgyal monks might not have noticed anything significant. “The Red and the Black were given the name oracles and strictly entrusted with the activities of the line of Dalai Lamas but, so to speak: ‘Sending ritual cakes to the northern gate when the devils are residing at the eastern gate should not be done”. I understood his statements to mean that it was not right for a new man to make offerings and prayers to a new god without maintaining the confidence of Palden Lhamo and Gyalpo Ku-nga, who have acknowledged designations. That day the Cabinet were present as usual during the Oracle’s trance and after witnessing it, I called them to my office. I talked over the meaning of the statement with them in detail. I disclosed everything to the Cabinet ministers about how my relationship with the Gyalchen had begun, how his prayers and invocation had been conducted in the meantime and how I had told Nechung to keep silent when he made his first statement about it. I told them how, later, when the “Yellow Book” was published I had maintained impartiality, as one should in a court of justice, and how I then asked Nechung to speak out and what he had said, and finally how, mindful of it’s importance, I had employed the dough-ball divination. I told them that now it was improper for a member of staff who was working for me and the Tibetan Govern­ment to make offerings or prayers to Gyalchen or anyone else except Gyalpo Ku-nga and Palden Lhamo. However, I told them that if an individual personally relied on Gyalchen, then that would a be a matter of his own religious freedom and he could do whatever he wanted, but I made it clear to them that it was incorrect to depend on Gyalchen formally and officially in connection with the Tibetan Government’s affairs, which would be quite a different matter. After that I sent a message through the Chant-leader and the Disciplinarian to the Esteemed Abbot of Namgyal Monastery stating that from that day onward there was no need for the monastery to say Gyalchen’s invocation prayers or the annual grand propitiation ceremony and thus, they were prohibited. That was done on the tenth of the first month and I think it was on the twelfth that Yongzin Ling Rinpoche returned from Bodhgaya. I went to meet him and explained to him everything that had happened. On the thirteenth I met Trijang Rinpoche on his return from Mysore and I told him in detail all that had occurred. If this is what was indicated by Nechung and the dough-ball divination then it must be true. There is no room for deception. As far as Nechung is concerned, I know full well that he gives first class predictions without any error on important issues, and likewise as regards the dough-ball divination, for it was conducted before the ‘thanka of the speaking Palden Lhamo’. After the Great Fifth Dalai Lama had died he revived, while the Desi (Regent) was crying in despair and begging to know how many years he should keep (his death) secret and so forth, and said, “You can decide the less important issues yourself, but more important matters should be decided through dough-ball divination conducted before the ‘thanka of the speaking Palden Lhamo’ , which was the meditational object of His Holiness Gedun Gyatso, for that will be infallible”. This is the very thanka he spoke of. There have never been any mistakes in the dough-ball divination conducted before it, there is absolutely no deception in it. There must certainly be a reason and purpose for that. In general, conflict between Palden Lhamo and Shugden is impossible, but the present discord between them is probably connected with Tibet’s spiritual and political affairs. Trijang Rinpoche did not believe there was a conflict in general between the two but that the present circumstances arose from the spiritual and political affairs concerning the Government. During the reign of the Fifth Dalai Lama many common and uncommon circumstances occurred which could have given rise to this. Such was the explanation Trijang Rinpoche gave. Anyway, he had been told everything and I also felt very relieved. Then, Trijang Rinpoche said to me, “Would it not be good to give the thanka you have to someone who is relying on Gyalchen?” I replied that I did not remember I had a thanka of Gyalchen and that I had forgotten it until now. I wondered whether it would be all right to keep it with the rest of the thankas. I thought that if for some reason I could not keep it I would offer it to Trijang Rinpoche and that I would decide whether to keep it or not either by dough-ball divination or by asking Nechung. The next day, the fourteenth, happened to be the occasion for the State Oracle’s (Nechung‘s) New Year prophecy in my private apartment. At that time I asked for guidance, saying that I was happy to have received his unequivocal declaration recently, which had been confirmed by the result of the dough-ball divination. I said that on my part I would follow this course with regard to what I should observe and what I should give up. I told him I had a thanka of Gyalchen which I would keep if it were all right to do so, otherwise I would offer it to Trijang Rinpoche and asked which would be better. The Dharma-protector replied ferociously, “It should be removed immediately from the residence of Loppon Thongva Donden (ie. The Dalai Lama)”. After the Oracle’s trance I sent the Ritual Assistant at once to offer the thanka to Trijang Rinpoche. In that way I did away with it. Well, that’s once chapter of the story. Sometime later when I was doing retreat on the “Kagyad Chidril” (bka’a-brgyad spyi-dril), which forms part of the “Dag nang gya chen” (dag-snang rgya-can) of the Nyingma tradition, I had number of good omens in my dreams, which I won’t tell you now because they are not relevant to the present context, and just before my departure to Ladakh to give the Kalacakra Initiation in the mid-summer of the Dragon Year, I received a letter requesting divination from Jangtse: College of the Ganden Monastic University. The letter said: “For sometime now various misfortunes have continuously befallen Jangtse College and many students are experiencing difficulties. General divinations have shown that there seems to be some negative reaction from a protector. Sometime ago advice was sought from Trijang Rinpoche and a new “Tan-zas” (rten-rdzas) was created for Palden Lhamo and a grand propitiation ceremony was properly performed. Please examine by divination whether there is still a negative reaction from Palden Lhamo at present”. This letter requesting divination was brought to me by Serkong Rinpoche. Ganden Jangtse is a monastic college where Je-Rinpoche’s doctrine is preserved and students train accordingly. Due to the kindness of Jangtse monastic college in training their students many qualified and obliging scholars have arisen, such as Serkong Rinpoche and the Esteemed Abbot whom I am employing at present. Now if such a monastic college where students engaged in study and practice where to experience deterioration, it would have an adverse effect on Je-Rinpoche’s doctrine, so the matter is quite important. I thought it would not be right for me to make a decision through a hasty divination, for they had made a request to me because they were unable to judge for themselves. Mindful of the importance of the matter I did a dough-ball divination. I enquired whether the misfortunes constantly befalling Jangtse monastic college were due to a conflict with Palden Lhamo or not, the result was: “It is due to a conflict with Palden Lhamo”. I did another dough-ball divination, if there is a conflict with Palden Lhamo, is it due to some other factor or it is because of too great a dependence on Gyalchen. “There is a conflict with Palden Lhamo because of too great a dependence on Gyalchen” was the outcome. Although the first response was – “It is due to a conflict with Palden Lhamo; because the second outcome was — “There is a conflict with Palden Lhamo because of too great a dependence on Gyalchen”, I felt quite confident about it. However, I could not judge how people would react or what opinions they would form if I were to mention this in a letter or not. Nevertheless it would not be correct for me to give an account which differed from the facts because they had turned to me because the matter was so important. I had difficulty in deciding what to do, so I called Serkong Rinpoche and the Esteemed Abbot and told them the outcome of the two dough-ball divination I had done at the request of Jangtse monastic college and to which I had attached great importance. I told them I was in a quandary for it was expedient neither to explain the matter clearly nor to remain silent. I discussed with them what, from their point of view, would be the best course to follow. In the end I did not write the specific details, but confirmed that the problem was due to a conflict with Palden Lhamo and that, therefore, full faith and confidence should be given mainly to Palden Lhamo. I wrote that every precaution should be taken with regard to new protectors other than those who had been relied on in the past and in this way I gave them a hint. I told Serkong Rinpoche and the Esteemed Abbot that they could both give a proper explanation to dependable monks of Jangtse monastic college when the time was right. Both of them sent oral messages with the monk who came to receive the response to the request for divination and it seems they sent letters too. In Jangtse monastic college there were many monks who had received the “Life Entrustment” of Gyalchen and who had been reciting the propitiation and invocation prayers to him in the assembly hall and after this they made little change in terms of abbreviation. Later, I met Abbot Yeshe Thupten of Loling Monastic College, Abbot Gedun Zangpo of Jangtse Monastic College and Abbot Lekden of Sera-Je Monastic College when they came here for the Annual General Meeting of the Dragon Year (1976). I gave them a full explanation and I even asked Abbot Gedun Zangpo of Jangtse Monastic College what he had done in his college — he said changes had been made in the recitations done in the assembly hall and so forth. After I had given this thorough explanation it seems that the Esteemed Abbot reviewed the situation in Namgyal Monastery once more. Last year I received a second letter requesting divination as I was about to leave for south India. The letter said that the prayers which had been recommended following the divination requested the previous year had been completed and requested a further divination to examine whether the conflict with Palden Lhamo had subsided and whether the matter was now clearly settled. I personally gave great importance to this. Usually, when I have to make an important journey I make a thousand ‘tsog’ offerings to Palden Lhamo and on this occasion together with a grand propitiation I did a dough-ball divination. When I enquired whether the discord between Palden Lhamo and Jangtse Monastic College had subsided or not, the outcome was —” Even now it has not subsided”; Therefore, I did another divination to discover what to do in order to mitigate it. I asked, “Is it necessary to accumulate prayers of confession and propitiation to Palden Lhamo and make a great offerings to her in the assembly?” or “Should reliance upon Gyalchen be restricted more rigorously?” The outcome was that reliance on Gyalchen should be more severely restricted. As I was about to go to Mysore, I did not send a letter to give an account of the divination. After arriving in Mysore I had a discussion with the Abbot of Jangtse Monastic College. I told him the outcome of the second dough-ball divination which I had recently done and asked him what he thought was best to do. He requested me to explain the matter to a group of the staff and Geshes of Jangtse Monastic College and advise them. So on the day I visited Ganden I gave a brief explanation, in a small private room at Jangtse, to a group of about ten, the Abbot, Chant-leader and some of the Senior Geshes of Jangtse, concerning the earlier and later divinations I had done on behalf of Jangtse. As there was no need to tell my own story, I did not. To sum up, if you think and gain some understanding of these matters, you will see that now and in the past I have taken into consideration everything that occurred and have taken no hasty decision which would later be a cause for regret. A series of examinations were conducted and results were checked and weighed against each other, which indicated that if one relies on Gyalchen then a conflict with Palden Lhamo arises as was mentioned on different occasions. Although the importance of the Oracle’s predictions and divinations is difficult to assess, considering them and omens I received in dreams, the indications were extremely clear. I almost forgot to tell you this; when I first asked Nechung about Gyalchen, in his reply he said clearly, “There is more harm than good in relying on Gyalchen. For that reason, when the previous Dalai Lama was alive, I, the spirit, had informed him in his very presence of such matters”. Moreover, when Gyalchen was studied and investigated and detailed information was collected there were strong indications that Nechung was antagonistic on different occasions during the time of Gowo Choezur (a former Nechung Oracle), when both the Government and private individuals relied on Gyalchen. This information has been kept alive in the oral traditions of the senior Geshes from Drepung. Similarly, a prophecy previously given at Drepung asks “How can it be that the Tulku Dragpa Gyaltsen is born as a spirit ?” I gained a clear understanding of that from one of my dreams, but it is difficult to say whether that is reliable. Moreover, another oral tradition of some senior Geshes from Drepung has this to say: “There was discordance between Nechung and Kyabje Phabongka”. Accordingly, a summary of the outcome of the questions and doubts presented to Nechung incidentally during the course of trance is as follows: One of the main reasons for Palden Lhamo’s displeasure is that while the guardians of the Gelugpa doctrine are protectors of all three levels of practitioners, because they do not seem to be enough, a protector with a new face is becoming more popular than all the others. Another reason is that Palden Lhamo is the exclusive protector in whom the line Dalai Lamas have placed complete trust; because a new wrathful protector has been relied upon, as if in competition with her, she has become displeased. What’s more, it seems that the present Gyalchen, who has an aggressive nature, is neither an incarnation of Panchen Sonam Dragpa nor an incarnation of Tulku Dragpa Gyaltsan. If you ask, then who is he? It seems that he is someone who made evil prayers. For that reason anyone who strongly relies on Gyalchen is eventually subject to various calamities, whatever he may do. Sometimes there are disturbances in the general cause of Tibet headed by Gyalwa Rinpoche, one of the conditions for which seems to have been the exploits of this protector. I asked Nechung, “If that were the case, how was it that Kyabje Phabongka, who was a true yogi and a fully qualified, spiritually realized lama accepted him as a qualified Dharma Protector? And how was it that the lineage of this protector’s ‘Life Entrustment’ practice originated from a vision of Dulzin Dragpa Gyaltsen received by Tagp’u Dorje Chang?” The protector told me in great confidence that the Maha Vidhyadhara (rig-‘dzin chen-po), referring to Kyabje Phabongka, had made great mistakes in the latter part of his life. “But that is not to say that I, Pekar Gyalpo, am displeased by the great errors which took place. However, you will understand if you examine what misfortunes and misjudgments occurred during the last phase of activities of the Maha Vidhdhara’s life”. He told me, “You will understand if you examine what kind of bad omens occurred at the time of the death of his re-incarnation in India. Not only that,” he added, “the line of his successive incarnations will not be able to bring their life’s work to completion”. Many people know that Kyabje Phabongka faced difficulties, but many people thought that because of his great reputation and his service to the Gelugpa doctrine that other schools of tenets such as the Nyingmapas had cast spells on him, so the Nyingmapas were blamed for his difficulties. However, the facts seem to differ from that, for it seems that hid difficulties occurred as a punishment from the Black and the Red protectors (Nechung and Palden Lhamo). Now with regard to visions there are two types; visions arising from the three sources of divine blessing and visions arising by force of harmful interferences. I doubt that this is a case of a vision caused by harmful interferences. There are critical as well as urgent matters like this which one dares not speak openly about. A few years ago, around the time that Nechung had just given his first prediction (about Gyalchen), I had a dream of Kyabje Phabongka telling me that I should embrace the “Life Entrustment” practise of Gyalchen. Ling Rinpoche’s chief attendant came in front of him and said that it would be all right. However, I was terrified and very upset because a scar on Phabongka’s wrist was bleeding. Now after some reflection I have realized that this was probably an illusory display by harmful interferences. But this is a digression. The matters I have explained were of an extremely urgent nature and unable to bear the responsibility alone, I first told everything to Yongzin Tri Rinpoche (Ling Rinpoche) in detail, but he was not that upset. After that I told everything to Trijang Rinpoche, for I felt that if I were not to tell him, my conscience would weigh heavily on me, but when the time came I felt as if I dared not tell him. That notwithstanding, until now Trijang Rinpoche’s life, deeds and beneficial activity have been nobly fulfilled throughout and as long as the Buddha’s Teachings do not decline in Tibet, Kyabje Rinpoche’s manifestations must come because of his compassionate thought and the firm pledges he has made. From our side too, we should make prayers and wishes accordingly. In such matters it is not good if anything should go wrong. Trijang Rinpoche’s reliance on Gyalchen is not something he has begun anew in this life, for he has relied on him since his previous incarnation and there is no need for him to stop now. However, Palden Lhamo is pre-eminent, below are Gyalpo Kunga like the treasurer who holds chief responsibility in a family, while Shugden should be seen as an ordinary store-keeper working under him. In other words, if he is regarded like a local deity or a personal birth deity and is propitiated and invoked in that way, I think, that would be all right. If, however, one were to think of his having equal status with Gyalpo Ku-nga or even higher status then them, then there is a danger of conflict with Gyalpo Ku-nga. Although Kyabje Phabongka was an inconceivably great lama that is what happened to him. I explained clearly to Trijang Rinpoche that this should be borne in mind. Yongzin Tri Rinpoche has not had any difficulties in his activities, but then he was formerly a hard-headed Geshe from Drepung. So, this is how the two Tutors came to know of these matters and understood them thoroughly. I told Trijang Rinpoche that these issues concerning Gyalchen were very sensitive and that I was placing a restriction on Gyalchen, different people — some with knowledge and others without knowledge — would come to seek his advice. As he was aware of all the causes of the early and later events, I asked him to please give advice on such occasions, which suit the dispositions of his questioners, because a word of advice given by Trijang Rinpoche would carry greater weight with those who rely on Gyalchen than a hundred or thousand explanations that I might give them. Gyalchen is relied on chiefly by Trijang Rinpoche; if after understanding the purpose and reason he, who actually depends on Gyalchen, were to give an explanation, others would certainly believe it. Although I am giving an explanation, some people believe in it whereas others don’t. Therefore, I suggested, it would be good if Trijang Rinpoche were to give such advice, similarly, I also asked Yongzin Tri Rinpoche to give such, advice. Apart from a little explanation I have given to a few trustworthy ex-abbots and Geshes when we met, I have never said a word about this to a large gathering until now. When I examined how it would be if I were now to explain recent matters to a general assembly of Namgyal and Nechung monks the result was good, and accordingly, I have today given such an explanation to all of you gathered here. Have you understood […] Remember the series of events both before and after. You will understand that this restriction is not being imposed because of my likes and dislikes if you look for yourselves into the conditions from which these events developed over a period. This matter has become a very sensitive topic, so you should each take great care, people may give you different information or may come to clear their doubts about what they have heard. If you have occasion to give an explanation, then what I have told you today are the bare facts, if you base your account on them, the meaning will be understood by people with an unprejudiced outlook, who are prepared to apply reasoning. So, if you have an opportunity to give such an explanation, well and good. We have here religious communities of Namgyal, Nechung and the Upper and Lower Tantric Colleges who are responsible for performing rituals. I have already told both the Abbots and Lama Umzed (Monk-Prefects) of both the Upper and Lower Tantric Colleges and they know everything. Among those of you who go out to perform rituals, I told the monks of Namgyal Monastery last year not to recite Gyalchen prayers, if someone outside requests you to recite Gyalchen prayers, you can say that the monastery does not do that practice. Even if it is inconvenient for monks of the two Tantric Colleges, who visit private households to perform rituals, to discontinue this practice all at once, it will be better if they can avoid it. You Tantric Colleges have two Dharma protectors whose practi­ces have been continued from Jetsun Sherab Sengye and his spiritual sons, what need is there for more: It would be absurd if the elaborate performance of “Trochu” (khro-bcu) and the offering of Druqchu-ma (sixty section ritual cakes) were an insufficient practice. It is best if we pursue our own studies and follow the traditional way handed down by previous lamas without omitting or super-imposing anything. There will be nothing insufficient in doing that. Would it not be better not to have to do so many ostentatious propitiations? However, if it can’t be helped and you feel obliged to recite it out of deference to a considerate benefactor, I think it would be better if you could say it in an abridged form. If you need to recite other prayers which are not included in the repertoire of one of the Tantric colleges you should consider prayers to Palden Lhamo and Ku-nga as principal. 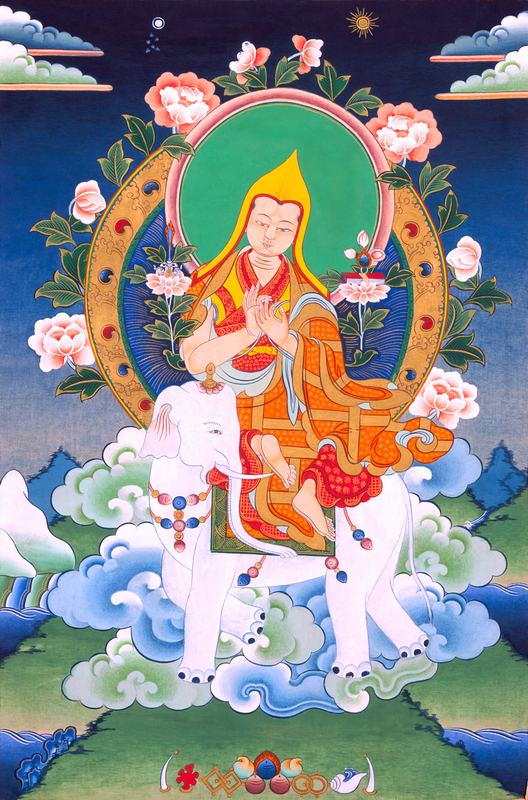 If you should have to recite prayers to Gyalchen, apart from the abbreviated invocation prayers, it would be better not to accord him the same honour and respect given to Dalha Gyalpo (dgra-lha’i rgyal-po), the king of Guardian-Protectors. Now have you all understood? I explained this roughly to the teacher of the School of Dialectics last year, but today he has understood the matter in every detail. If there is interest among your fellow Geshes and friends and also if you feel it is convenient to tell them, you can explain this to them. Have you understood? It is good if you can understand the state of affairs clearly, [missing] if you upset through not understanding them. Now matters concerning Venerable Zemey, which are related to the publication of his book. To begin with when his name was on the list of candidates for the seat of Lama Umzey at the Upper Tantric College I threw a “Mo” first concerning Venerable Lati, then Zemey and after that the names of Geshes in order, but the outcome was not at all favourable to Zemey. Not knowing what to do I left it for a few months. Around that time the Venerable former Abbot of Namgyal came to see me and I told him that the outcome of the “Mo” concerning the candidates for the Lama Umzey’s seat had not been good and asked him, “Is there a better, candidate?” He told me that the assembly of the Tantric College had great hopes for Zemey Rinpoche. I replied that it was true, that he was qualified and could shoulder the responsibility. Immediately after this meeting I threw a “Mo” concerning Zemey Rinpoche himself, but the outcome was still no good. I thought it was strange and again, left it for a while. Then, after another one or two months I threw a “Mo” once more thinking that it would not be right if a final decision about the position of “Gyupa Lama Umzey” were not taken soon, but the outcome was not good at all. Anyway, there were obstacles to Zemey Rinpoche in the three “Mos” I have thrown. Around about the time that there were those obstructions, the yellow book had just been published, so it seems that the result of the “Mos” had not been good because he had created powerful causes which would inevitably result in his punishment before long. If the “Mo” had been favorable and he had become Lama Umzey of the Upper Tantric College, and his book had then been published and caused trouble, then his position would have become more established – it’s quite remarkable. That’s enough —Tashi Delek. Background of the second talk: An excerpt concerning reliance on gods and protectors from a talk given by His Holiness the Dalai Lama to a gathering of abbots, lamas, workers and senior monks of the Drepung, Ganden, Sakya and Nyingma Monasteries at Mundgod (India) on the 25th of June, 1980. Of late the way of relying on the Dharma Protectors has become something of an issue and in fact you already know something about it. I thought that as a group of responsible people has gathered it might be helpful if I were to say something about it. You have had difficulties over this and I too have had complications and problems. Up to now I had thought that these would be overcome, if I personally, in a bit to solve the problem, discarded some things and adopted others. But in the course of this, as the saying goes, “You bang your head when you get up and hurt your bottom when you sit down”, I was in the difficult position of not knowing what to do. There have been many authentic cases of people experiencing mishaps and failures due to this issue of protectors; yet most did not know what the underlying cause was. Although I did know what it was, it was neither proper to keep silent knowingly, nor was it proper to talk about it. This was the quandary I was in. Obviously, you also had problems in not knowing what to do. Although those of you from Jangtse College were in difficulties about what to do, nevertheless you listened to me and appreciated the situation as far as you were able. I have never reacted like a startled rabbit with respect to this matter, taking rash steps without any investigation. Not taking Nechung’s declarations simply on trust, I have done a series of investigations over the years. Since the time of the Victorious Gedun Gyatso, the Second Dalai Lama, Nechung has been one of the two state protectors referred to as the Red and the Black protectors, who have had special connection with Tibet’s Ganden Podrang Government. He has not been created at some later stage and more important, he is a deity who has never let us down. But when it comes to Gyalchen, I have been particularly cautious. If you ask what definite conclusions I have come to, I cannot say what the ultimate inconceivable identity of Gyalchen may be. If, amongst human beings who we can see directly with our own eyes, we can not gauge the nature of another, how then can we know the nature of a deity? However, if you are a person who relies mainly on Lhamo (Shri Devi), and Gyalpo Ku-nga (the Five State Guardians), it is certain that in terms of practical life they somehow do not approve of reliance on Gyalchen. From an historical point of view there was certainly a plan for Gyalchen in the begi­nning, however, I have the impression that things did not go well according to the initial scheme. Whether a mistake occurred or some mischief slipped in some way or another, it seems the matter is fraught with problems. According to those who normally take Gyalchen as a valid protector it was Nechung who induced him initially and provided the provocative condition, so they need to rely on Nechung to trace Gyalchen’s origin. If Nechung’s support is needed, the way things stand at the moment it may be that I know Nechung better then any under the sky and when I examine all the relevant matters from beginning to end it is quite clear that Nechung Dorjee Drakden does not favor a person who turns to Gyalchen. Whether the time is not ripe or whatever the reason may be, it is hundred percent certain that under the present circumstances he is unsuitable and brings more loss than gain. Similarly, it is certain that mishaps have occurred when persons relying on Palden Lhamo turn to Gyalchen. The biography was about Chang-kya Rol-pey Dorjee, written by Thue-kan Cho-kyi Nyima. Trichen Dorje Chang, the Great Throne-holder Vajra Dhara cited in the account as an example, refers to the Victorious Kelsang Gyatso’s (The Seventh Dalai Lama, 1708-1757) tutor, the first Reting, the then Great Ganden Throne-holder, Ngawang Chogden (1665-1751). This account was related about Trichen Ngawang Chogden, a purely Gelugpa lama, unlike the Victorious Fifth Dalai Lama (1617-1682) who was not allied to just one Dharma tradition; it was narrated by Chang-kya Rol-pay Dorjee and written down by Thue-ken Cho-kyi Nyima. So, this is a story concerning three prominent lamas of the Gelugpa order, which shows that from early times this issue has been very troublesome. Some great learned and spiritually evolved persons have proclaimed (Gyalchen) as a valid protector and even in their personal lives they have achieved amazing success; there are such persons to this day who we can see for ourselves. On the other hand as I told you just a while ago, the story of Gyalchen has been murky since quite early time. It is because of this that I have had to explain the situation and suggest some restrictions. However, I have not done this for political reasons or other purposes. Kyabje Trijang Rinpoche has, not only in the present life, but also from previous times had a close rapport with Shugden and has treated him as exceptional. From beginning to end I have fully informed Kyabje Rinpoche of this matter and he knows all about it; I am not talking about something he doesn’t know behind his back. The principal sources of this matter have been derived from dough-ball divinations conducted before Lhamo and the decrees of the Dharma Protector Dorje Drakden (Nechung). As for Nechung, Kyabje Rinpoche affirms from his own experience that he is absolutely reliable. He said, “Never has Nechung failed in crucial moments; certainly there must be reason for his speaking thus.” Similarly when I also told him about the former and later instances of the dough-ball divination, except for saying, “the dough-ball examination conducted before Lhamo is never misleading, there must be an inconceivable reason and purpose (for that).” He never acted as if he had misgivings about the outcome of the tests, and because of this I feel at ease. I am by no means ignoring or deriding Trijang Rinpoche but it is possible that some, failing to understand things well, may feel apprehensive about this. This is the complete account of the earlier and later causes of this issue. Now, if an individual personally has a special karmic relationship with Gyalchen or through his own experience has found him favorable or his teacher after perceiving some significance has instructed him to turn to him and propitiate him, since he is at liberty to practice religion, he is free to decide what religion to practice. Similarly, he is free to decide what protector to rely on; no one can say this is allowed or not allowed. It is his own choice. However, just as I have told you, if a person treats Lhamo and Gyalpo Ku-nga as pre-eminent then there are stories of mishaps occurring if he then relies on Gyalchen. Therefore, I feel it will be beneficial if the collective religious bodies like the monasteries and their colleges are cautious about this; they are not at fault if they have been unaware of this issue. I too nearly took a disastrous step, I had recited Gyalchen’s invocation prayers very diligently and even informed Kyabje Rinpoche of my wish to receive “Life Entrustment.” Later sensing something amiss I thought, “Now, if I am not careful this won’t be safe”. I conducted a dough-ball examination and dice divination which were so convincing that since 1975 I have completely stopped the practice. I have not even had a portentous dream to make me wonder if the deity was vexed. If we examine the history of Lhamo and the Five State Guardians they are found to have been inconceivably reliable. Can you tell how long the Drepungpas have relied on Lhamo? Is there any special account of her during Jamyang Choje’s (1379-1449) time? I wonder if she didn’t enter the picture at the time of the Victorious Gedun Gyatso (1475-1242), because “The Lord of Siddhas” (grdub-pa’i dbang-phyug) which is recited in the assembly today was presumably written and offered by Khedrup Norsang Gyatso (1423-1513) to the Victorious Gedun Gyatso as a long life prayer. Normally speaking there is no way that a work by Khedrup Norsang Gyatso would find a place in the Drepung Assembly prayers, but he and the Victorious Gedun Gyatso had an extraordinary mutual teacher and student relationship and while the Victorious Gedun Gyatso was serving his term as the Drepung Throne-Holder he incorporated the prayer for the fulfillment of wishes along with prayers invoking Lhamo into the Drepung Assembly recitations. Considering the nature of the story I have told you, I wondered if this dream was not connected with it. So, there are many reasons why many highly qualified persons chose Lhamo and Gyalpo Ku-nga as protectors. Since they are infallible we can be quite at ease; they are protectors who we can by no means afford to abandon. On the other hand there is no need of those protectors who are fraught with complications and about whom we require many explanations to determine who they actually are. Background of the third talk: An excerpt concerning reliance on the Dharma Protectors from a talk given by His Holiness, on the 18th July, 1980 at the Sera Religious Establishment to a meeting of ex-abbots, abbots, workers, a group of senior monks and the members of the Bylakuppe Regional Working Committee of the Tibetan Youth Congress and others. It occurred to me that I should say something about the issue of Dharma Protectors. You have had a hard time with this, but that is not your fault. With regard to myself, I too have really had great difficulties with respect to reliance on the protectors. Formerly, I too used to rely on Gyalchen and I recited his invocation prayers without a break. I even informed Kyabje Trijang Rinpoche of my wish to receive “Life Entrustment” from him and Kyabje Rinpoche had then got hold of a Lam-rim text needed during the “Life Entrustment” ritual. (Since this was later changed, he gave me the scripture separately). Hence, I also got caught in a great dilemma. The tussel was between my teacher Kyabje Rinpoche and a ferocious deity on one hand and mainly Palden Lhamo and the Gyalpo Ku-nga on the other. I was between the two. Since I am among the incarnations of the Lord Gendun Drup, the first Dalai Lama (1391-1474), it would be unbecoming if I did not conform my actions to the practices of the line of former incarnations of the Victorious Lords (the Dalai Lamas) and their glorious lives. In particular, beginning with the Peerless Fifth Dalai Lama the responsibility for wielding secular power of Tibet has fallen on the Dalai Lamas. Since I am shouldering responsibility for Tibet’s religious and secular affairs at present whether successfully or otherwise, Palden Lhamo and Dorje Drakden, the minister of the king of speech of the North direction, who is the embodiment of the Gyalpo Ku-nga, being the principal protectors relied upon by Tibet Ganden Podrang Government have an extraordinary connection with this responsibility. Some former officials have remarked that the past administration of Tibetan Government was entrusted to deities. It seems they were right, decisions were not simply taken by men after deliberation, instead a deity was consulted and then rituals were performed. If the administration was entrusted to a deity, it would be strange if that deity was then left unsa­tisfied, otherwise men would have find their own means. As it was deity-orientated, it would have been pointless if the deity in whom the decision-making power was invested were not gratified. For instance, at the beginning of the Chinese intrusion, when I was still young, whenever the Government performed the summer and winter and other invocations of Nechung, he showed signs of being pleased before me and gave scrupulous advice on matters concerning Gyalwa Rinpoche’s (my) personal security. But when asked on the religious and secular matters he would only burst into taunting laughter. On occasion Gadong was used as an inter­mediary to invite Nechung and in view of the critical period Tibet’s religion and politics were passing through, the cabinet fervently requested Nechung to give clear-cut directions, but laughing a scornful HA-HA he disappeared. Beginning around 1952 I started invoking Nechung in my private apartment and our relations gradually improved. As we became closer Nechung’s decrees became clearer and he started taking greater initiative in Tibet’s religious and political affairs. These days, for instance, whatever reluctance or divine resentment Nechung may have had, it has completely left him. After the flare-up of the controversy over the religious protectors in particular, I felt a sudden change in his attitude, like a dramatic change in the weather, and at that time I also had some very extraordinary dreams. Basically the source of discord came from Palden Lhamo’s side. From then on, as it became clearer and easier for me to decide which protectors to turn to and which to avoid, I began to have greater success correspondingly. Just as I began to achieve greater success in my work there were clear indications that Tibet’s religious and secular affairs, which are connected with my work, simultaneously started looking up. Basically it is luck; along with an increase in luck, success is related to the virtuous assistance of the protectors as a precondition. 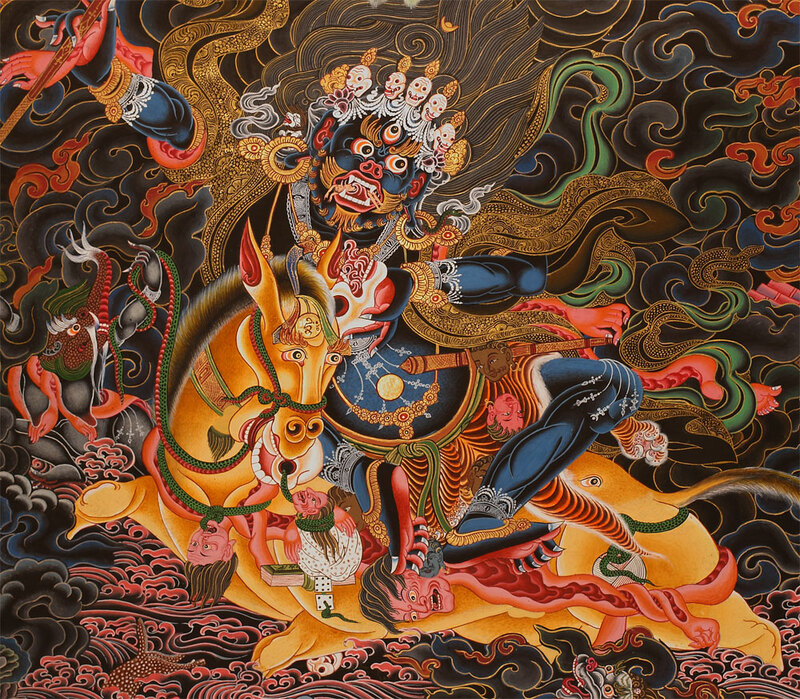 In the same vein, I have written prayers invoking Tibet’s guardian deities and protectors. As I wrote them I wept, thinking of the plight of Tibet and how Tibet’s guardian deities and protectors, such as the Twelve Guardian Goddesses (bstan-ma bcu- gnyis), who are under the strict command of Acharya Padma Sambhava and who like we human refugees have become miserable without leadership and refuge. I am just a single-handed man. I do not have any qualities or power of either a spiritual or worldly nature and although I am equal among men, because I bear the title of Gyalwa Rinpoche, the Precious Victor, I have tried to cheer up Tibet’s guardian deities and protectors. It is distressing, for among them, some like Wo-De Gong Gyal and Machen Bomra etc. are indigenous to Tibet and it is as though we are from the same stock. Anyhow, many conditions prompted me to compose these invocation prayers and they proved very beneficial. In this way, through my own experience I have seen that many things have been verified. I have examined things from various angles and in conclusion, although I am not saying that Gyalchen is imperfect, however, it is quite clear that if a person depends mainly on Palden Lhamo and the Gyalpo Ku-nga, whether the dependent is an individual high lama or a monastery or a college, it is detrimental then to turn chiefly to Shugden. It is like raising a huge building here at the Sera religious establishment, if things are done elaborately, they may look splendid for a short while, but as pomposity increased, there will be more gossip about it and this will eventually create a rift in the community. Fearing you would feel very upset if I had to speak about it after the building was complete and its interior decoration and fittings were installed, I thought, “What if I tell them about it from the outset, then it will be up to the monks to listen or not. Since the long term interest and the interests of the majority are the most important, although some may not like it at the time, I had better tell them about it clearly so there won’t be any cause for regret later”. This why I wrote you a letter. As you have unswerving faith and commitment to Gyalwa Rinpoche, I felt happy when you a heeded me and said you would do exactly as I told you. Although you had difficulties in doing so because you remained silent it has worked very well. I must say, “Thank You”. I have distributed to each of the colleges a transcribed copy of a talk I gave sometime ago at Dharamsala concerning the causes of the issue of the Dharma Protectors, hoping that it could be understood with impartiality by those who would really like to know. But if it isn’t properly understood, it will be pointless if it is misused only to spread rumor and gossip. As the causes were explained in detail in that talk I need not spell them out here again. These investigations were done most thoroughly. Nechung’s declarations have never failed us at critical moments, the dough-ball examinations conducted before Lhamo in your apartment are the same. After the Fifth Dalai Lama had breathed his last, the Desi desperately prayed to His Holiness for guidance because the responsibility for the completion of the building of the Palace etc. had fallen on him. His Holiness revived once more and said to the Desi, ‘Don’t be so depressed, you can decide general matters through your own discretion; as for those you can not decide, conduct a dough- ball examination before this thanka painting of Lhamo which was the chief object of worship and reliance of the Victorious Gendun Gyatso.’ No one to this day has ever been deceived by a dough-ball examination done in front of this thanka. There must be special significance behind this. That is what Kyabje Rinpoche himself told me. It seems, that some people who haven’t understood the situation are saying that Gyalwa Rinpoche’s guru-devotion practice has degenerated and that he is rising against his two tutors. Whatever they may say, it doesn’t make any difference to me, for as we say, “You must be true to yourself”. If you haven’t done anything wrong, then that’s that. It is possible that some who are unaware of the matter may wonder, “Now, what is this?” Well, I have told you how the story goes. Besides this, I explained it to Kyabje Rinpoche himself and that as far as he is concerned, being the chief disciple of Kyabje Phabongka he is following his guru’s practice in relying on Gyalchen and having a connection with Gyalchen from his former lives, he hasn’t created a new one which didn’t exist before, so that he needn’t abandon Gyalchen, but I requested him to consider two things; that it is imperative not to misjudge who is the chief and who is the subordinate protector and that what may happen in future lives is uncertain, although he has had a successful career in this present life. I haven’t been like those who will say behind someone’s back what they can’t say to his face or who bully a person who can be bullied and roll up in meekness when he can’t. So this is how things are in general. Whether you are from Je College or Mey College or an individual house, you must hold as pre-eminent the protector who has been assigned by the founder of the monastery or the college. Apart from that, there is no point in adding new ones to those you already have anti being over-elaborate about them. But if an individual through his karmic relations with Gyalchen has received tangible and commonly acknowledged results, then that is an exception. Otherwise things can turn out worse than better if you indulge in various elaborations. I nearly did the same; I, who am called ‘The All Knowing One’, and who bear that title nearly fell under the influence of ignorance. Thus, there is a danger that you too might fall under the same influence. So, you must all be particularly careful. Now, as for Gyalchen’s story; basically Gyalchen is established as valid by citing Nechung as the source. There is an account which says that in the beginning Nechung’s miracles evoked him, intermediately, Nechung induced Panchen Sonam Dragpa and finally, Nechung made him meet with a condition (to rise as Gyalchen). If Nechung has to be depended on, then today under this sky no one knows Nechung better than I do; and after thinking about it and investigating it I find that there is no support or backing from Nechung. A plan had been drawn up in the beginning but owing to some obstacles it did not meet with success. Though I do not have any clairvoyance, I have done thorough investigations from various angles. May be I am being stubborn, but even if something is stated by lamas I examine it by comparing and contrasting it with what Je Rinpoche has said. Similarly I do not simply take for granted what a Dharma Protector has said. I think about it, and even do divination myself. Thus, I am very careful and cautious, and do not act rashly. That is my nature. About Nechung, I inquired through Gadong whether Nechung’s judgement has been direct and unerring both in Tibet and after coming to India, “He can be trusted completely” was the answer. Presumably, there are some who speculate that this issue has arisen because I listen credulously to Nechung and that there is disharmony between Nechung and Gyalchen, which is like some ordinary jealousy between them. Basically, Palden Lhamo is at the root of this. Moreover, if we Gelugpas accept the validity of popular conventions, we must conform to what is widely known in the world. What is called inconceivable and secret is a different matter. Just as we found yesterday, in the Golden Garland Of Good Explanation (legs-bshad gser-phreng) that the presentation of popular conventions would be inexplicable if we had to base them on the miraculous transformation of an instant into an aeon and aeon into an instant by the high level Arya Bodhisattvas. Similarly, we cannot base our practices of abandonment and accomplishment on the inconceivable secrets which are only within the Tathagatas field of experience. Thus, we must go by what is most widely accepted in the world. If we do this, then it is doubtful whether the present Gyalchen is the next birth of the continuum of Tulku Dragpa Gyaltsen or whether Tulku Dragpa Gyaltsen was the reincarnation of Dulzin Drakpa Gyaltsen. Even if we assume he was, still this business arose not out of harmony, but from the disharmony between Tulku Drakpa Gyaltsen and the Victorious Fifth Dalai Lama, as is evident if you read his biography. If we say that the well-known things mentioned in the biography were for the sake of less intelligent disciples or were related from the point of view of worldly conventions, and that matters of inconceivable secrecy are somehow different and extraordinary, well then, let us first develop a refined consciousness capable of experiencing such mystical things. If we had such a consciousness we could then make use of them, but so long as our mind-stream remains an ordinary consciousness we simply have to go by popular conventions. If the person is at an ordinary level but the object of experience is something of inconceivable secrecy then he cannot experience it. In general, it is the tantras which speak of religious protectors. By engaging in the practice of deity-yoga once brings these protectors under control and commands them to assist one to accomplish various activities such as pacification, which are done as a means to attain enlightenment for the sake of others and oneself. But if a person who lacks such power beats a dilapidated old drum until it is worn out, it won’t do much good. Alternatively there will be visible benefits if one is serious about his practice of refuge and checks his observance of the law of cause and effect, it will be a better expression of the Buddhist outlook. Ordinary people especially, who have a deep-seated interest in food and clothing for the present life might see worldly gods and spirits as more beneficial and helpful then Buddha Shakyamuni when they are caught in a tight spot. Since there is no obvious rite to propitiate Buddha Shakyamuni in order to accomplish longevity, wealth and success in business ventures, there is a great likelihood of their entrusting themselves whole-heartedly to these gods. If this should happen the Buddhist practice of refuge is thrown to the wind and if the refuge practice is discarded, the person will cease to be a Buddhist. So, you must take the utmost care. Having understood these things, you should give up or retain practices accordingly. Those of you who have already sought “life Entrustment” with Gyalchen need not give him up, but can continue to rely on him. However, it would be good if you are not over-elaborate about it arid don’t give the impression that he is the Lord of the Dharma Protectors; rely on his without confusing the status of the protectors, taking the real state affairs into consideration. For those of you who have not sought “life Entrustment” from him there is no point at all in buying a noose for your own neck. The Kadampa traditions is the best. They had four deities: Buddha Shakyamuni, the founder of the Doctrine, Arya Avalokiteshvara, the deity of great compassion, Arya Tara, the deity of virtuous activity and Achala, the deity who removes obstacles. To these were added the paths of the three persons or the three baskets of teachings. Together, the tradition was called the Seven-fold Deity and Dharma Tradition. Their practice was as simple as that, without elaborate propitiation rituals like offering incense-smoke and gold-libation etc. to worldly spirits and demons. We have not achieved realizations like those gained by past lamas, yet we undertake many ritualistic performances which they couldn’t afford. In terms of virtuous assistance and accomplishments we have gained nothing from these rituals. So, this has been something about Gyalchen. I have been informal here, but I have spoken frankly, for there would be no point in talking at length about it otherwise. If you need to tell someone about it, then tell the complete story comprehensively, otherwise it will be better if you don’t disclose this to anybody as if it were some everyday affairs. Background of the fourth talk: An excerpt concerning reliance on the Dharma Protectors from a talk given by His Holiness on the 29th of March, 1983 in the Convention Hall above the Drepung Great Assembly Hall, Mundgod, to a gathering of ex-abbots and abbots of the three chief monasteries, the two tantric colleges, the Tashi Lhunpo, Nyingma and Sakya Monasteries. Now, one of the things I want to talk to you about is the Dharma Protectors. Today, an unusual new situation had developed. Since you are going to hear about it sooner or later, if I do not tell you the abbots, it is possible that through misunderstanding and confusion you may wonder what has happened. So I thought I should tell you what really happened before I leave this religious establishment. 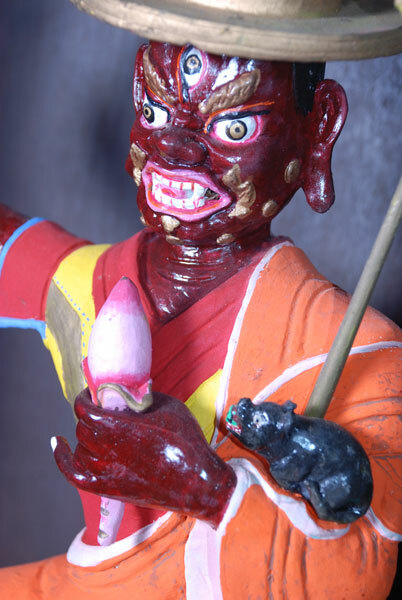 The Gyalchen statue in the Chogyal (Dharma Raja) chapel in the Great Assembly Hall of Ganden may have been made before I imposed a restriction on him. Still, even after the recent controversy over Gyalchen, it is not easy for me to ask that a statue which has already been installed be changed. It has remained like this for some years until now, since it was obviously not at all easy for the Ganden La Che, the Ganden Central Executive Committee members to do anything about it. After my arrival here the other day some people said to me, “There is a Shugden statue in the Ganden Chogyal chapel”. I told them that it had already been installed and nothing could be done about it. In my mind I did not have any intention to make an issue out of it and I had pretended not to see or know about it. I understand that you too were helpless to do anything except to leave it as it was. Then, I spend two nights at Jangtse College and two nights at Shartse College. On the second night at Shartse I had a dream; it was four in the morning when I woke up. At the end of that very disturbed dream, I saw a mace, said to be the symbol of office of the Chief Disciplinarian of the Great Assembly (Tsogchen Shal-ngo). It was like a mace made of wood, resembling the club belonging to Drepung Gomang College. A voice said, “This is Shugden’s main object of residence which was given to him by one of the Panchens: it must be destroyed. I thought to myself, “How can it be destroyed? Unless it is smashed with a hammer or sawn into pieces, it can’t be done.” At that moment, one of bodyguards called Chogyal (Dharma Raja) said, “It must be smashed with a hammer; it will not do if it is not totally destroyed.” Someone said, “That’s a good idea.” On examination the mace was found to have a silver band around it. Since it couldn’t be smashed with a hammer the silver band had to be removed with a chisel, Chogyal the bodyguard said, “I will smash it to pieces.” Nearby where it was being destroyed, there was a lake into which I threw the broken parts. On the top of the mace there were three or four green peg-shaped knotted tassels and it occurred to me that it would not be proper if these fell in people’s hands. So, I removed them and threw them into the lake. This was the kind of dream I had. On waking I became curious and wondered what the dream meant; I did a rosary-divination with the intention of discovering whether the dream was worthy of a consideration or not, and the resultant number of beads was seven and eight. That very day I was to pay a visit to the Great Assembly Hall of Ganden. Although I usually conduct dough-ball tests before Lhamo, on this occasion because there was a special connection with Dharma Raja himself, I thought it would be better to do the dough-ball test before him while making a sixty-section cake offering. I wrote our three points and gave them to Tawawar, asking him to roll them up in three dough-balls. I sent word to have sixty-section cake made in the private chamber of the Ganden Assembly Hall. Nobody else had faintest idea of this development and I thought it would not be appropriate if any non-humans came to know of it. On reaching the Great Assembly Hall, I recited The Hundred Deities of the Joyous Land (dga’a-ldan lha-brgya-ma), one rosary of Mig-tse-ma and then A RA PA TSA which is what I usually say. At the end of the recitations of the name mantras of my gurus, I generated the inner and external Dharma Rajas through instantaneous upright generation (skad-cig dkrong-bskyed) and recited Dharma Raja’s commitment restoration and confession prayers and his name mantra a few times. Then I made the sixty- sectioned offering. When I was about to roll the dough-balls I recited Mig-tse-ma, the mantra of Mahakala, and Lhamo respec­tively a few times and then I rolled the balls before the sixty-sectioned cake was taken out. The three options I wrote down were: “It would be better to leave things as they are”, “It would be better to wait for a better occasion in future to take a step”, because I thought a time would come to renovate Ganden, and the statue could then be taken sway without being noticed; and “It would be better to change things now”. While rolling them, another option came to mind; “If it would be better to change things now, would in be better to speak of it right now or to mention it after the hectic Monlam festivities have subsided?” Since, there was no way to roll this into a dough-ball there and then, and because at times the dough-ball falls off languidly and at other times it jumps off suddenly, I said to myself mentally, “If I have to tell them right now, the dough-ball should jump out at once and if I have tell them after the Monlam festivities have sett­led, the ball should roll our slowly.” Generating this inten­tion, I rolled the three balls, and one jumped out suddenly. When opened it read, “It would be better to change things now”. That being the outcome, I sent at once for the abbots, ex-abbots, some important officials, dialecticians and senior Geshes from both Shartse and Jangtse Colleges. Explaining things to them above the Assembly Hall just as I have explained them to you now, I asked then, “Can the statue of Gyalchen be taken to a place where there is a Gyalchen shrine or given to a Gyalchen devotee? If not, there is nothing to do but to plead with him (the wisdom being) to leave. However, as has been said, “If you think you can’t do what you have been told, explain the reasons for your inability.” Just as we find in the Restoration and Purification Sutra (gso-sbyong) I asked them once, twice and thrice, “Have you anything to say?” but they said nothing; so as it says further, “If nothing is said, it should be taken as it is.” (i.e. the proposal isaccepted). So that’s what I decided. This unforeseen event took place recently. The Ganden Central Executive Committee will see to it that the decision is carried out. Since the news about this will spread gradually to other monasteries, it is possible that some will say that the statue of Gyalchen in the Ganden Great Assembly Hall has been got rid of. If such people some, tell them that I have not taken this step rashly through guess work or without examining and analysing things. I did not have any previous intention to do such a thing, but on my arrival here I had that dream. Now, there is no point in giving importance to dreams for, generally speaking, we will continue to have mistaken perception as long as there is ignorance in our mind-stream. If we have mistaken perceptions while we are awake, then dreams are doubly mistaken, so there is no relying on them. However, wondering what my dream could mean I did a divination and got a result. Still, out of great concern, making the sixty-sectioned cake offering and praying fervently to Dharma Raja, I conducted a dough-ball test above the Assembly Hall and I got the results I mentioned earlier. In this way I have been extremely careful and have not acted indiscriminately. Since this matter will be much talked about later, I wondered if the presiding abbots of the colleges would then explain the underlying cause of this matter. Since the Tantric Colleges, Tashi Lhunpo Monastery and the other colleges will also come to hear of it, if you explain to them the earlier and later causes of this issue what I have told you about it and how things stand now they will be convinced. That is why I thought I should give this explanation to you. Thank you very much for posting these. We have to thank the person who gave it from his archive … and those who translated, scanned and digitalised it (OCR / text recognition). It must have been a tremendous amount of work. Hello, I really liked to read an see some stuff, the only thing I disagree is about the NKT, everything I read I didn´t have experienced, not even a single prohibition of knowing the other traditions, never been asked to donate a single penny, I question the professors a lot, principally because I want to learn, and never had any problem with it. Today I was in some discussions about the Dalai Lama and NKT differences, I have my own oppinions, and, like all the Budhism, in a logical way I disagree with some stuff. Thank you. Feel free to share with what you agree, disagree, what you find reasonable and useful or to share your opinion. There are local differences and also differences how NKT treats outsiders or those who are not fully committed to the NKT. So there will be a variety of experiences, however, we as NKT insiders and once fully committed followers stress the general tendencies we observed, experienced and also instilled in others. Leaving aside the money issue for now, with respect to the first point, “prohibition”. There is no official “prohibition” and I’ve never used that word or a word similar to it. Usually I phrase the situation in NKT like this “NKT encourages to not study or read books from other Buddhist teachers and traditions” and then I give also references or quotes for what I claim (see e.g. Fundamentalism in Buddhism). The NKT system works not that black and white, it rather “encourages” you to “practice purely” by “not mixing pure Dharma [NKT teachings]” with “other traditions”*. Otherwise, you risk that you don’t attain “any realisation”. Sincere practitioners of the Kadampa Buddhism of Je Tsongkhapa’s doctrine should undertake as their heart commitment to cherish the Kadam Dharma, the doctrine of Je Tsongkhapa, and to practise and teach this to others without mixing it with other traditions. We must take some responsibility to enable pure Buddhadharma to flourish throughout the world. If we make the commitment to accomplish this aim, then this is called our heart commitment. Keeping this heart commitment is the basic foundation for receiving Dorje Shugden’s protection, blessings, and special care continually. Because Dorje Shugdan is an enlightened being, he has compassion for all beings and is ready to giving his protection, blessings, and special care but from our side we also need some necessary conditions. These are to cherish Kadam Dharma, to practise Kadam Dharma purely without mixing it with other traditions, to teach Kadam Dharma without mixing it with other traditions, and to take some responsibility to help pure Dharma flourish throughout the world. Doing this as our commitment is the best. By receiving these we will definitely be able to fulfil all our wishes, and all our daily and spiritual activities will be successful. Enlightened beings, or Deities, cannot work alone without our making certain, conditions from our side to receive their help. This is important to keep in mind. * Note, for NKT Gelug teachings and the books by Gelug teachers – including the English translation of Je Tsongkhapa’s texts(!) – are considered to be “other traditions”. ** The NKT do not even say that you should not read or practice other books or traditions they use the fuzzy phrase of “not mixing”. So an NKT follower has to interpret for him- or herself what “not mixing” includes. For some it includes to not even have any other Dharma book than those of KG for some it means not to tell in public teachings what they read in any non-NKT book. A GP NKT teacher I know was just fired because she mentioned a non-NKT book during the GP teachings, a translation of Shantideva’s text at a time when the NKT/Elliott/KG translation of the work was not yet available. So, H.H. Placed restrictions on the Shugdan practice, but didn’t ban it?? Yep. You can do it, but don’t do it in my house. He asked that people who wanted to have a teacher-disciple relationship with him, respect his advice to not practise Shugden. And for those for wanted to continue practising Shugden and ignore his advice, not to attend his teachings so that a teacher-disciple relationship was created.